I haven’t put a cartoon up for a while, so here is a cartoon. I’m the Renaissance Man on the right. ***Gratuitous calendar mention alert*** It’s not on the 2011 calendar, but perhaps 2012 (or maybe 1485). 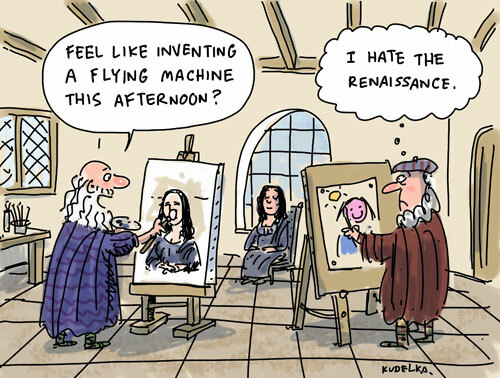 …and yes, the Enlightenment and the Renaissance were in fact different things. Now, can anybody spot my retrospectively deliberate mistake? Are those eyebrows on Lisa’s head? I may have just given away the plot to the sequel of The Da Vinci Code. Forget you saw anything.